Tennis elbow (aka Lateral epicondylitis) often gets in the way of doing the things you love. It can even affect the simplest of tasks like making a cup of tea. You don’t have to be a John McEnroe or Sue Barker to suffer with tennis elbow. It is actually a misnomer as it occurs in roughly only five percent of people who play tennis. The cause of tennis elbow is down to repetitive strain of the forearm extensor muscles. Practically any occupation, sporting endeavour, or household activity that has repeated use of the forearm and wrist may lead to this condition. 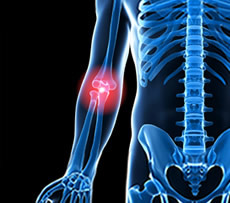 Certain activities and occupations are more commonly associated with tennis elbow, such as plumbing, painting, fishing, computer use, and playing certain musical instruments. Tennis elbow is most common in adults between the ages of 30 and 50, but can affect people of all ages. Tennis elbow causes pain from the elbow into the forearm and wrist, it is normally made worse when lifting or gripping things. The pain caused by tennis elbow will make the arm feel weak – so things like picking up a kettle, turning a doorknob, or even shake hands can feel difficult. In many cases, your chiropractor can diagnose tennis elbow (Lateral epicondylitis) simply by listening to you describe your symptoms, performing a physical examination, and learning about your lifestyle and activities. However, if your physician suspects other reasons like a pinched nerve, fracture, or arthritis are causing your pain, he may suggest X-rays, Magnetic Resonance Imaging (MRI), or Electromyography (EMG). Tennis elbow isn't going to disappear over night – as a general rule it can take 4-6 weeks to resolve the problem. As with any condition sometimes it can be slow to respond initially but remember to persist and not get discouraged. Rest, avoiding certain activities especially if they are painful. Ice, twenty minutes, three to four times per day. Compression, occasionally your chiropractor maybe advice a brace if the problem is particularly severe. A chiropractor will be able to determine if a misalignment in your spine, neck, or shoulders may be causing an overcompensation injury. Many patients are surprised that adjustments to the spine of the neck (cervical spine) and mid-back (thoracic spine) are helpful in resolving tennis elbow. These regions are, after all, not even adjacent to the elbow. A key chiropractic principle is that the body functions as a whole, not as a jumble of isolated parts. Nerves travelling to and from the entire body enter and exit the spinal cord via joints between spinal bones. Consequently, dysfunction in the spine may influence nerve flow to distant joints, including the elbow. In addition, muscles, tendons and other structures form an interconnected “chain” from the spine down the shoulder and arm. If you’re suffering from tennis elbow, we can help you squash the condition. Call our office today to schedule a consultation. We look forward to helping you get back in the game.